Hannah Kerrigan fumbled with collection cups, measuring tape, a clipboard, and other tools as she swam through the kelp forest. Visibility was usually spot-on beneath Alaska’s seawaters in March, but Kerrigan’s scuba mask was leaking. The 25-meter swim worsened as the kelp snagged her legs. “That was the moment when I was like, ‘This is difficult, but not impossible,’” she recalled. Two months prior, the Maine native had had no experience with scuba diving. Six weeks into the Alaska Dive Semester at the University of Alaska Southeast Sitka, Kerrigan had completed more than 20 total dives in Sitka Sound. The 12-credit semester is the brainchild of Associate Professor Reid Brewer and Assistant Professor Joel Markis. The seven-course program includes three separate diving courses, a cold water survival course, two courses on small vessel operation, and an internship. Students finish the semester having completed 30-60 dives, and receive 11 certifications in diving, research, and safety. As a marine science major at the University of Maine, Kerrigan signed up for the dive semester because it was not only a résumé booster, but also an affordable way to study “somewhat” abroad. With housing and meals factored in, the program costs about $10,000. UAS Sitka does not charge out-of-state tuition for the program. Students start with training videos and bookwork before demonstrating dive techniques in a pool. They complete open water dives — including night dives, 60-foot dives, and wreckage dives — for their certifications. Skill building includes compass use, entanglement training, and equipment maintenance and repair. 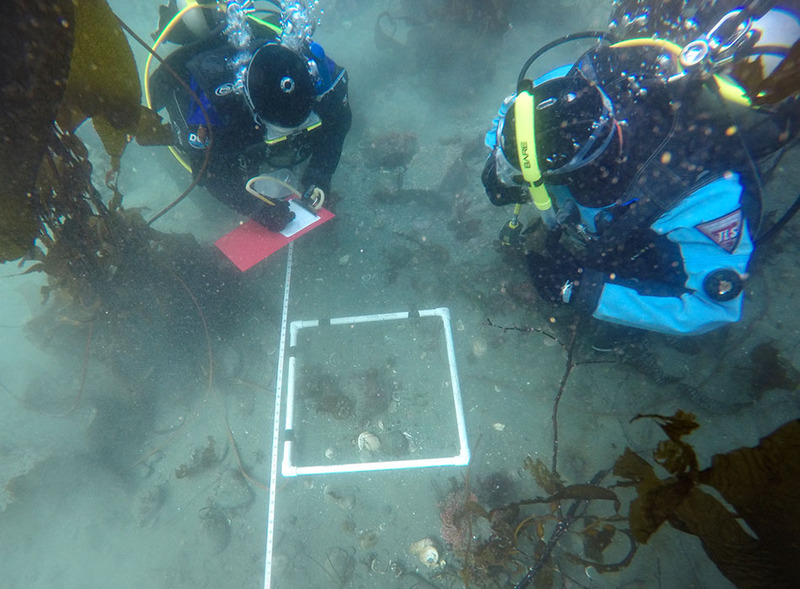 Moving into scientific diving, students create their own research tools, including swath bars, collection cups, and data slates. 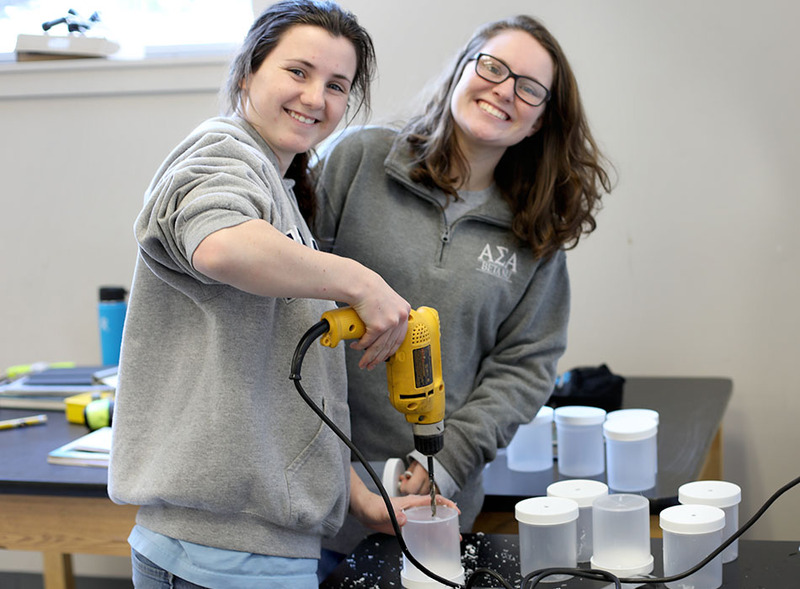 Brewer and Markis challenged students to test their tools and sampling techniques by estimating the dollar value of some 2,500 coins that they had poured into a local pool. The instructors promised students that if they came within a five-percent margin of the actual value, they could keep the money for a pizza party. Individual estimates ranged from $20 to $100, but students pooled their data and estimated that $73.62 lay on the pool floor. The guess was within a one-percent margin of the actual value ($72.82). The prize funded 12 pizzas. “It was really cool for them to see why subsampling is important, and students really seemed to say ‘This was valid,’” said Brewer. Students continued scientific diving, where they learned mapping, organism identification, and how to deploy and retrieve oceanographic instruments. Practice sites ranged between Sandy Beach (where distraction and entanglements were kept to a minimum), to a kelp forest off of Magic Island. The semester culminated in a research internship, through which students measured the Sitka Sound’s biodiversity by sampling 40 sites around the inlet. They compared the kelp and invertebrate (fish and sea stars) abundance between protected and exposed locations. Students also determined the seafloor composition at all sites. “That was a massive undertaking. It put all our skills to the test,” said Kerrigan. Though sometimes facing poor visibility, tall waves, and mechanical problems with the boat, Kerrigan found the challenge worthwhile. “Science is hard and an absolute mess. Not a single one of us has a bachelor’s degree. Two don’t even have high school diplomas, and we made this work,” she said. The team presented its findings following the four-week internship. Now in her senior year, Kerrigan is using that data for her capstone project. The Alaska Dive Semester has already helped her secure a spot in a graduate-level course that includes diving in the southern Caribbean. She hopes it will also be a selling point when she applies to graduate school. Brewer said the 2018 dive semester was a success as three students got jobs in marine science and/or diving as a result of their participation in the program. All 15 openings have filled for the 2019 semester, and there’s a waiting list, he added. 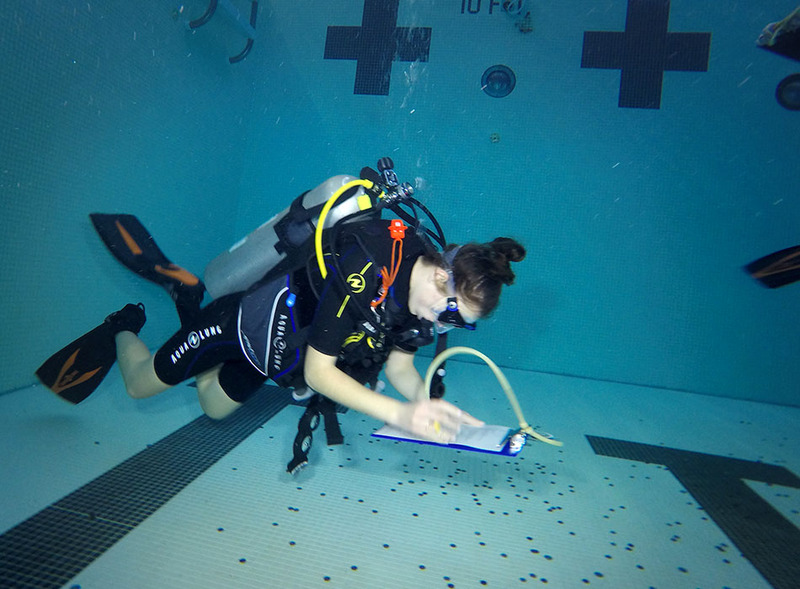 Prior, the university’s Fisheries Technology Department had taught a semester-long dive class that met once a week. That class is being phased out and replaced with the intensive dive semester, said Brewer. The intensive, hands-on program launched in Spring 2018. Twelve students from 10 different universities signed up and stayed at the Fisherman’s Quay, a local waterfront lodging separated from the university by Sitka Harbor. Kerrigan and her peers would kayak or paddleboard to class daily, she said. They also regularly gathered for movie nights, house dinners, and hiking trips. “[Scuba diving] is just 15 percent of what that semester is about. I truly just think about the friends I made, the experience with Reid and Joel, friends I made in the community…,” Kerrigan said. 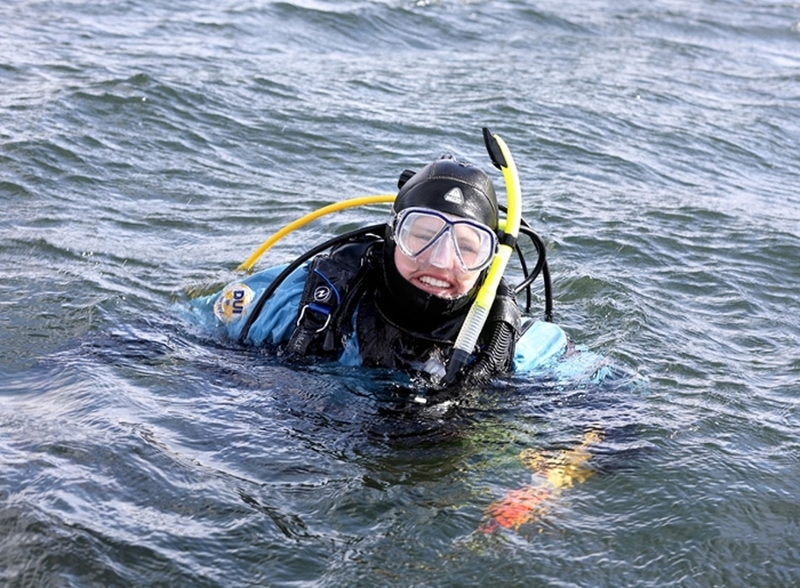 For acceptance into the Alaska Dive Semester, students must get a medical clearance and pass a swimming test, Brewer said. For more information, visit http://divesemester.alaska.edu.